Since moving to Scotland, we have become huge fans of shortbread. You can find shortbread at such low prices, but not all shortbread is made equal. 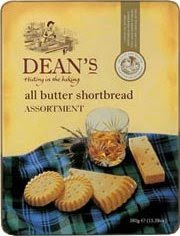 We recently discovered Dean's Shortbread ... and this may possibly be the best shortbread I have ever had. Last weekend we went out to Huntly to visit Huntly Castle and take in the sites of the town. And guess what else is located in Huntly? That's right, Dean's Shortbread Factory, along with a gift shop and bulk-packaged shortbread biscuits. Thanks, Emily, for introducing us to Dean's and recommending we stop at the factory. We wandered through the gift shop looking at all the yummy shortbread and other Scotland treats (jams and relishes and other sweeties). In the end, we picked out several different kinds of shortbread from their bulk section. Some of my favorites are the Orange and Chocolate Chip, and the Coconut and Chocolate chip, and of coarse, the original. These are biscuits that are set aside at the factory and placed in simple, inexpensive bags, instead of the beautiful packaging you find at the stores. And did I mention that the bulk items are sold at terrific prices? If you are ever in Huntly, make sure you take the time to stop by. They have a little cafe, but it was closing when we arrived at the end of the day. There is also a viewing gallery, where you can look over the factory productions, but they don't make shortbread on the weekends, so all we saw was a dark room. We did, however, snap this shot of the kids with the local Huntly piper. This shortbread was originally sold to help raise money for the local pipe band. As the popularity grew, the started a small bakery and it had kept growing since. I don't know how easy Dean's is to find in the US, but I know they sell some of their products on Amazon.com. You really must check out this wonderful taste of Scotland. For more things people love, visit The Diaper Diaries. This sounds yummy! I don't think I've ever heard of it. I'm glad you guys got a chance to go!! I also love Dean's, as you know. I am quite impressed with Abigail's ability to discern between Dean's and "others." Awesome.